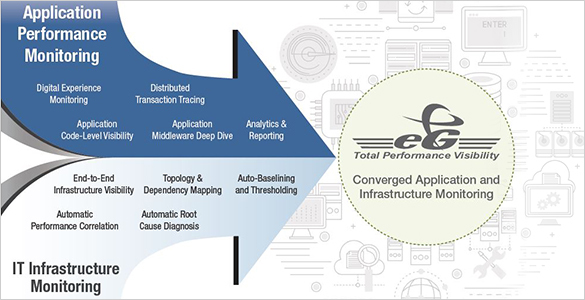 eG Enterprise is a groundbreaking application performance monitoring (APM) and infrastructure performance monitoring solution (IPM) solution that offers a holistic approach for monitoring user experience, business transactions, application code, and infrastructure performance – all from a single pane of glass. With correlated visibility across the application framework and underlying infrastructure tiers (server, database, virtualization, storage, network etc. ), eG Enterprise automatically discovers the root cause of the application problem for faster troubleshooting and performance optimization.